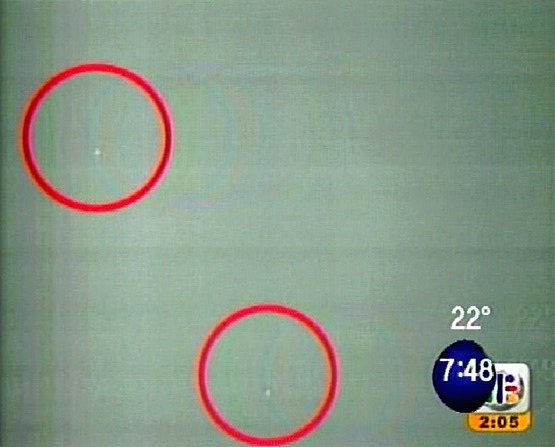 A massive UFO sighting took place on Friday June 24, 2005 in Xalapa, Mexico. This stunning event was witnessed by Xalapa's governor, Fidel Herrera Beltran, members of his staff, many officers of the Xalapa police department, newspapers and television reporters and many people gathered at Casa Veracruz for an official ceremony for the delivery of new police patrol cars to the police department. The amazing incident took place at 10:30 AM causing commotion, excitement - and some alarm - among the people and officials. 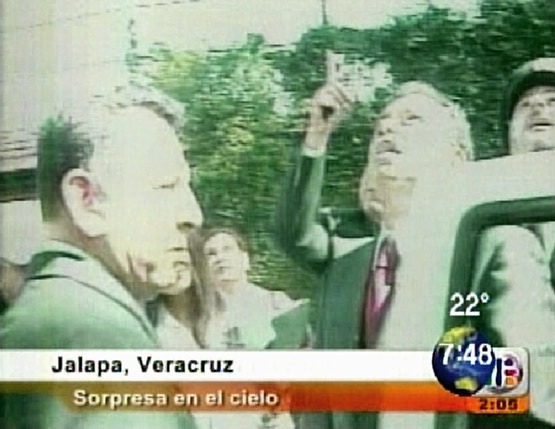 Just after governor Fidel Herrera Beltran finished a speech inaugurating the new units, his attention was called by his officials signaling to the sky where a strange spectacle was appearing. A spectacular UFO fleet of at least 14 unkown flying objects shocked the entire gathering at casa Veracruz who, pointing to the sky, screamed "OVNIs OVNIS!!" in a tremendous state of excitement. The police officers were also signaling to the sky wondering what these unknown flying obJects could be. Different reactions were heard from surprise, curiosity, confusion and even some laughs among the people who continued shouting "OVNIs!!" The newspaper reporters were taking photos and the television crew videotaped the entire spectacle. Governor Beltran took the microphone and said jokingly: "It seems the martians have arrived!!" The people wondered if the strange objects could be balloons of some kind, or real UFOs like those so many times reported over Mexico. 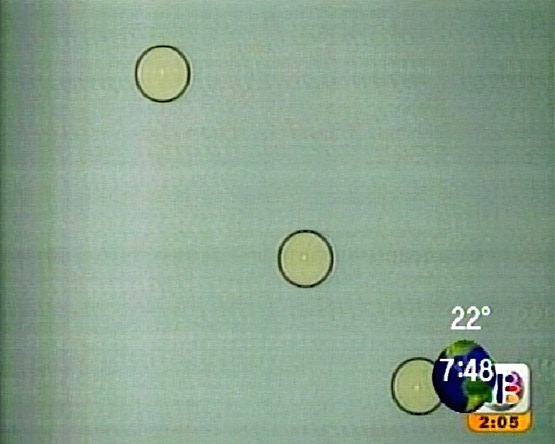 However, the engimatic flying objects remained almost static in the sky in formation describing a triangle pattern in perfect alignment for almost 30 minutes. On Friday night, TV Azteca presented the report with videos on their national tv newscast giving the account of the unprecedent incident. 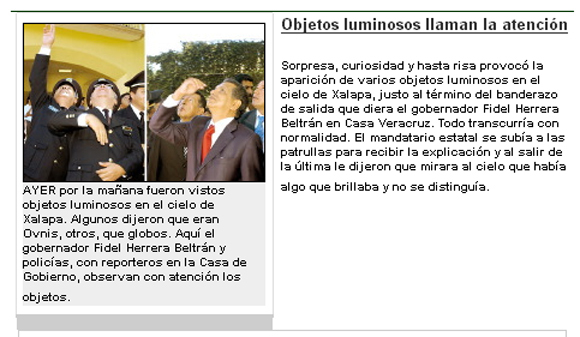 On Saturday June 25 the Diario de Xalapa newspaper as well as others published on main headlines the unusual event under the title: Luminous Objects caught the attention during official act. Special thanks to Arturo del Moral. 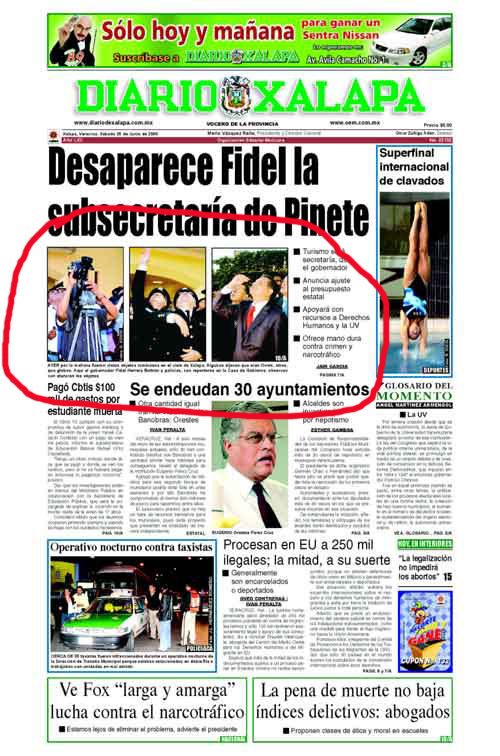 Last Friday's June 24 UFO sighting over Xalapa has continued causing stir among the local residents and the mexican ufologic circles due to the nature of the event that took by surprise Xalapa´s society as well as their local authorities including governor Fidel Herrera Beltran himself. The incident was reported by Xalapa's newspapers and TV Azteca on national television newscast. Their own images videotaped during the official event coverage have been shown on subsequent newscast editions by their affiliates nationwide. According to the media the incident remains unexplained. Today in a short article El Diario de Xalapa newspaper tried to desqualify the sighting saying that those objects in the sky were just balloons released by some kids on Friday morning. El Diario mentioned a single witness as their information source, a sever years old girl named just " Adriana " , a student from a local school who said some kids released balloons that morning. This statement could not be confirmed by the school's director neither by the teachers or the students. Assuming this is a lone testimonial it should be investigated more further to determine it's validity, however this kid " Adriana " has not been located yet by the researchers. It's important to take note of some considerations regarding this story and the implications of the diferent leveled witnesses involved. Besides there are enough materials in video and testimonials to be evaluated as evidences in this investigation an determine the real nature of the event. At diference of most common UFO sightings in Mexico witnessed by the people this particular incident was witnessed by a governor and his staff, a police department officials and media representatives so we can presume this was indeed an official sighting if we may say so. Then we may wonder if it was posible that these local authorities along with the media were just " fooled " by a bunch of balloons interrupting an official ceremony converting the formal act into a whole " Fiesta " among the joy and excitement of the people gathered there. The police members are trained experienced officers in matters of recognizement operatives. The television people reacts most of the time objective to this type of sighting incidents. All of them reacted surprised to the phenomena and could'nt give any plausible explanation at the end. Now this Diario de Xalapa's reporter comes with a single witness, a kid who said they were balloons implying all the people at casa Veracruz were fooled on Friday June 24. Could this be posible ? Seems unlikely. More research must be done. There are some facts that still have not been answered or explained by this reporter during the course of this investigation and by consequence of his latest article. Definitively the most compelling is the lenght of the sighting, from 10:30 AM to almost 11:00 AM. Questioned how it was posible for a bunch of balloons to remaing at that position in the sky for almost 30 minutes without changing it's pattern. The question was not answered. It result interesting that governor Fidel Herrera Beltran after some minutes that the sighting took place he continued reviewing the new police patrol units while the attention of the people was divided from the official act and the UFO spectacle. Sometime later governor Herrera returned to the stage and looking again to the sky he realized the UFOs were still there. Then he took the microphone again and began counting the objects: One, two - Thirteen, fourteen to the smiles of the people. Quite a unique reaction if those were common ballons. This incident will continue in discussion for sometime and also awakening a controversy. There are, at this time, several lines of investigation including an official one. The case is certainly recent and rich in materials to be studied and evaluated in order to reach a satisfactory conclusion if any. What we can confirm at this stage is the definitive awareness among the mexican people to this phenomena and their positive reaction confronting these sightings. Now the mexican authorities are also involved in these strange events witnessing by themselves what a whole nation has been reporting for quite awhile. 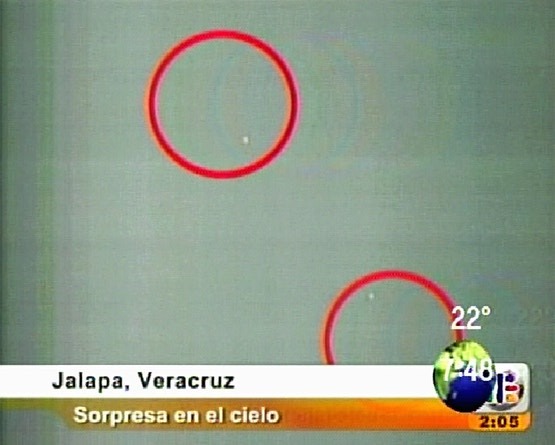 I'm sending you these jpgs of the UFO fleet sighting over Xalapa this Friday June 24 as reported this morning by local newscast INFO 7, a TV Azteca affiliate here in Monterrey as they are following the story for several days. In the meanwhile I'm expecting to receive the videos and the original TV Azteca Friday's report from Xalapa sometime this week. I'll send you more updates on this story as well as images. I just received a new report of a UFO fleet sighting videotaped over San Luis, Potosi the same day of the Xalapa's sighting Friday June 24. So we have now two sightings of UFO fleets from diferent cities with videos. I'll send you this new report with images as soon I receive the video and testimonials from San Luis. children's balloons released earlier that day.